Martyrs’ remains search and repatriation (MRSR) represents a sacred political task and the fine tradition of “Remember the source of the water we drink” and “Paying debt of gratitude” of the nation. Our Party, State, people and Army have always paid attention to and implemented the work by a number of measures in which international cooperation is an important one, aiming to bringing about an effective collaboration in the work both at home and abroad. Over more than 50 years of conducting national liberation war, international mission and Homeland protection, millions of men and women have sacrificed their lives for the independence, freedom of the country and happiness of the people. Right after the end of the war, with deep gratitude to the martyrs’ contribution, our Party and State have soon had guidelines and policies on MRSR. To successfully accomplish this task, we have mobilized the concerted effort of the whole political system, the synergy from all levels, industries, the entire people, troops and communities. Furthermore, we have placed emphasis on international cooperation, particularly with Laos and Cambodia to thoroughly conduct MRSR both at home and abroad. 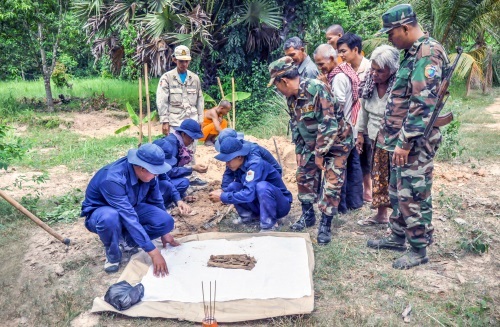 Accordingly, Vietnam’s Government has signed bilateral agreements with its Laotian and Cambodian counterparts in 1994 and 2000, respectively on the search and repatriation of Vietnamese voluntary troops and experts died in wartime in those countries. We have agreed on the establishments of the Governmental Special Board and provincial special boards with Laos, Governmental Specialized Committee and provincial specialized committees with Cambodia for the fulfillment of the agreements. 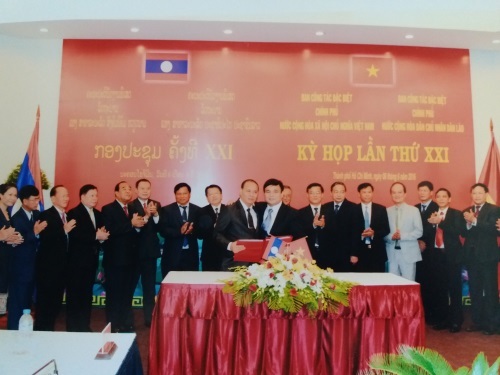 Over the past years, those boards and committees have closely coordinated with Laotian and Cambodian counterparts in the MRSR, hence bringing about positive results of significant socio-political meaning and great humanity, not only manifesting the responsibility of our Party, State and people to the martyrs but also consolidating the traditional relation, friendship and solidarity between Vietnam and Laos and between Vietnam and Cambodia. Grasping and implementing the directive of the Politburo, the decision of the Prime Minister, over the past years, the National Steering Committee 1237, the Governmental Special Board, the Governmental Specialized Committee, the Ministry of National Defense, the Ministry of Foreign Affairs together with military units, other ministries, industries and localities have actively adopted measures to broaden cooperation with foreign countries, related organizations and individuals in the fields of information collection, experience sharing, material and technical support and coordination in the search and repatriation of Vietnamese military personnel being killed and missing in war. 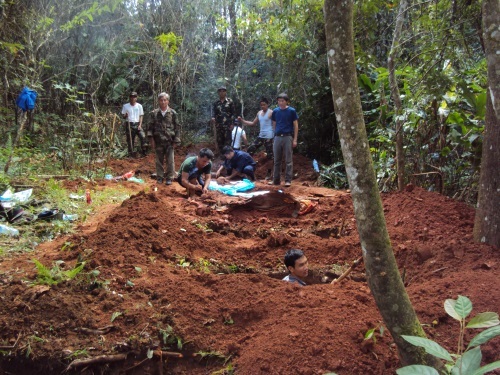 Since 2013 to date, Vietnam has found and repatriated nearly 4,900 martyrs’ remains from Laos and Cambodia. Besides, to realize the goals of the 1237 Project, the Ministry of National Defense and the Ministry of Foreign Affairs have proactively studied and proposed to the Government plan on widening international cooperation in MRSR. The National Steering Committee 1237 has actively built plan and strengthened cooperation with related countries to serve the work of MRSR. Since 2014, it has held meetings with governmental bodies, defense departments, and some organizations and individuals of the USA, South Korea, China, Thailand through which mechanisms have been agreed on to foster cooperation in exchanging information and documents relating to Vietnamese military personnel killed and missing in action that individuals and organizations of these countries are holding. Thank to the close cooperation, since 1994, NGOs and individuals of the USA have provided us with roughly 800,000 pages of documents and souvenirs relating to our troops killed and missing in action. These documents, together with other sources of information helped us search and repatriate over 1,200 martyrs’ remains, etc. In the coming time, MRSR will face more challenges and difficulties. To successfully accomplish this sacred task, besides enhancing the effectiveness and efficacy of state management, the mobilization of social resource, etc, we should continue to broaden and strengthen international cooperation to seek support and involvement of foreign governments, NGOs, organizations, individuals so that internal potential is combined with external one. Accordingly, ministries, industries, localities, socio-political organizations, firstly the Ministry of National Defense, the Ministry of Foreign Affairs and related localities should continue to grasp thoroughly the Directive 24-CT/TW of the Politburo, the Decision 1237/QD-TTg of the Prime Minister and external lines of the Party and then actively propose contents and plans on SRMR cooperation with related countries. To make it easy for broadening international cooperation in MRSR, information and experience sharing in the search of military personnel killed and missing in action should be made an official content in the senior diplomatic action programs of Party and State leaders. The Ministry of Foreign Affairs, Vietnamese embassies in foreign countries should strengthen information and propagation about the country’s guidelines and policies on MRSR. Moreover, diplomatic channels should be intensified to persuade foreign governments, organizations and individuals to provide information about Vietnamese military personnel killed and missing in action; share information, have policy and material supports for the MRSR of Vietnam. Pay attention to connecting and seeking personal information from overseas Vietnamese, etc. Promoting the achievements, functional agencies should accelerate cooperation with Lao and Cambodian counterparts to further the work in those countries. In the short term, the Governmental Special Board and the Governmental Specialized Committee should make thorough preparation for the 22nd meeting with the Lao Governmental Special Board and the 16th meeting with the Cambodian Governmental Specialized Committee to review and agree on the plan for MRSR in the 2017 – 2018 dry season and the coming years. To meet the targets, functional agencies, military regions, and localities should strengthen coordination with our partners to persuade their people, veterans, parties, landlords, pagodas, etc to give us information about our martyrs. It is necessary to ask for the help of Lao and Cambodian governments in directing their authorities and related agencies and their local people to support Vietnam’s task forces fulfilling their mission. Military regions and localities should pay attention to the establishment and strengthen their management over the task forces in charge of MRSR missions in Lao and Cambodia in the new situation. The Ministry of National Defense, the Ministry of Foreign Affairs, the Ministry of Labor – War Invalids and Social Affairs should continue to coordinate, review and propose to the Government plans for repairing, improving and building friendship monuments between Vietnam and Laos and between Vietnam and Cambodia in order to educate the fine tradition and deepen the friendship relation between Vietnam and these countries to speed up the search and repatriation of Vietnam’s voluntary troops and experts. The National Steering Committee 1237 should continue to carry out meetings and exchanges to broaden relations with foreign countries, organizations and individuals to foster the work. In particular, interactions and dialogues should be strengthened with the USA, South Korea, Thailand, Australia, the Philippines to decide on cooperative partners of the National Steering Committee 1237 and build cooperation mechanism for enhancing the effectiveness in collecting, treating and providing information about Vietnamese military personnel killed and missing in action that is being hold by organizations and individuals of those countries as well as in sharing experience, transferring technology and supporting Vietnam’s MRSR activities, etc. The Ministry of National Defense and the Ministry of Foreign Affairs should continue to work with functional agencies of China and Thailand to agree on the guidelines, roadmap and related procedures for the collection and repatriation of Vietnam’s martyrs’ remains in the two countries. In addition, it is necessary to study the experience of regional and world countries conducting the work and their thankful policies for martyrs and report to the 1237 Committee in order to unceasingly improve the effectiveness of the work. Grasping the Party’s viewpoints and upholding the fine tradition of the nation, the whole Party, people and troops should closely coordinate internal potentials with external ones, bring into full play the synergy in the MRSR mission in return to the great sacrifice of our heroic martyrs, contributing to building the “people’s heart and mind posture”, consolidating political and spiritual potentials of the great national unity bloc in the cause of Homeland construction and defense.